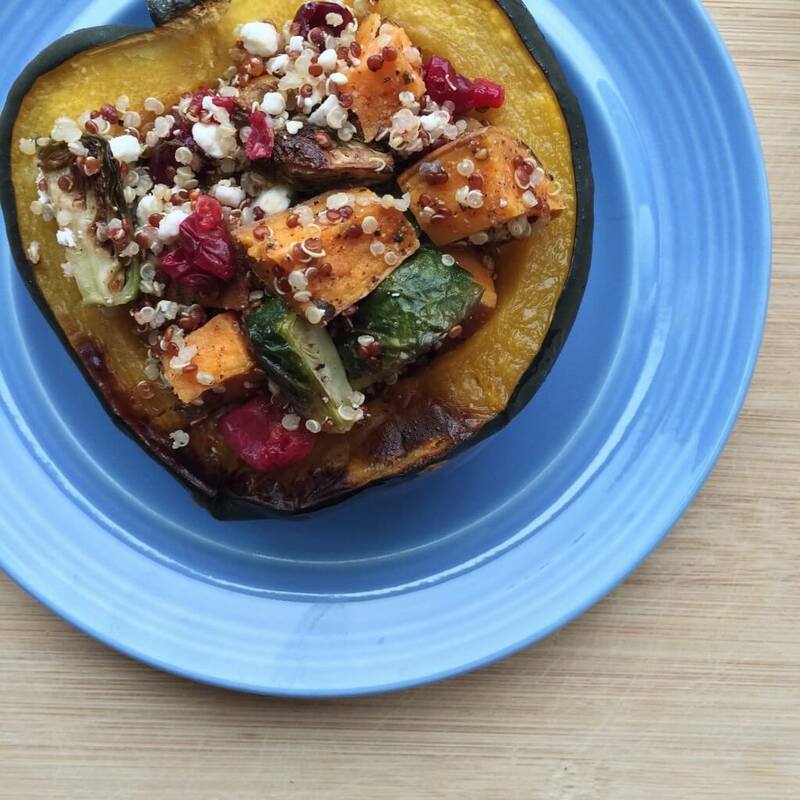 Before we jump into this amazing ancient grain stuffed acorn squash recipe that Clara developed for the HGN blog, I wanted to take a second to welcome her to the team! You may know Clara Norfleet from social media already. She’s the brains behind the popular instagram account Food Fitness and Faith and a blogger at My Daily Declarations She’s a nutrition grad from UGA (Go Dawgs!) and a superstar dietetic intern at Western Carolina University that is already making huge waves in the nutrition and food world. 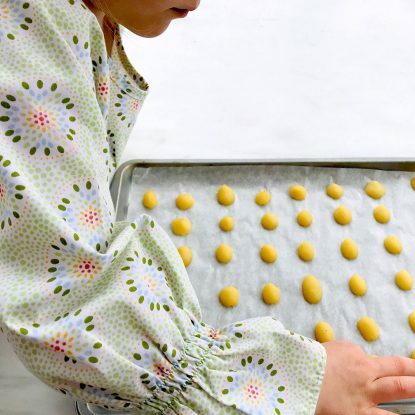 Below, Clara shares more about her food philosophy as well as one of her favorite fall recipes that certainly needs to make it on your table in the next week! Fall is in full swing over in Asheville right now, and with the changing leaves and cooler temps comes a craving for warm and comforting dishes that I can enjoy while wrapped up in a blanket on my couch….er I mean, at my dinner table. Wait. You’re probably wondering something like, “What is Holley doing in Asheville right now?”, right? Surprise! This isn’t Holley. 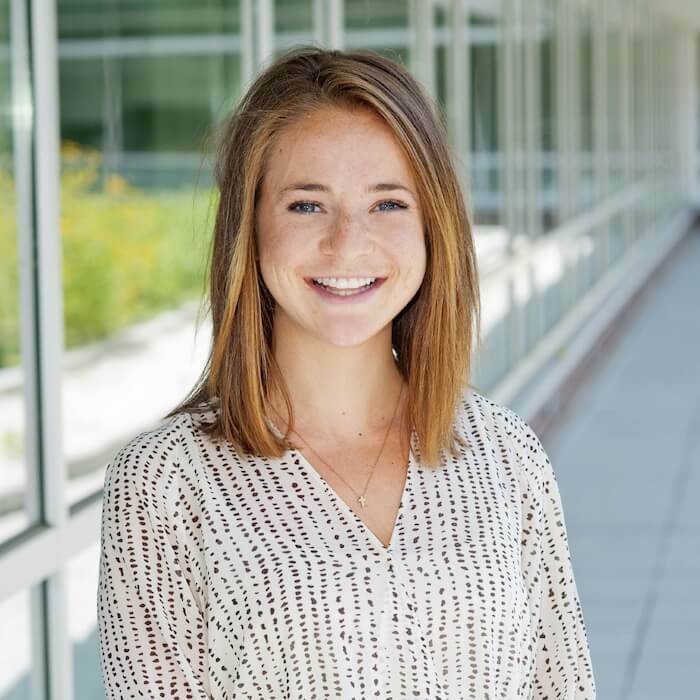 My name is Clara, and I’m one of Holley’s newest interns for the blog. I’m currently in the middle of completing my dietetic internship up in Asheville, North Carolina, and am absolutely LOVING the weather up here. 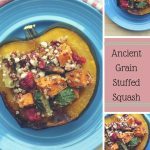 I’m not sure what it is, but I always seem to associate fall with roasted veggies, grains, and squash galore, and this recipe combines all three! 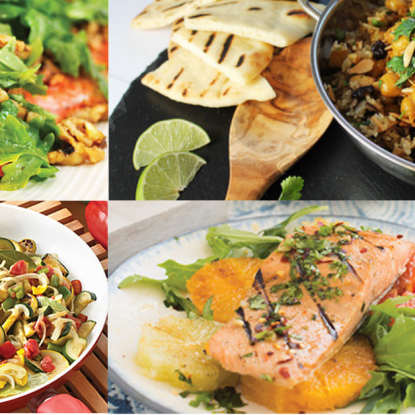 I think everyone has those one or two meals that they automatically default to making when a busy week strikes or when they’ve just plain run out of meal inspiration. You know the kind of week I’m talking about, the kind where your schedule is slammed with meetings, practices, or games to attend, with no time to make it to the grocery store, and no brainpower left to craft up a meal worthy enough to win Chopped. In these instances, you need a meal that is easy, nutritious, and accommodating to what you have on hand, right? 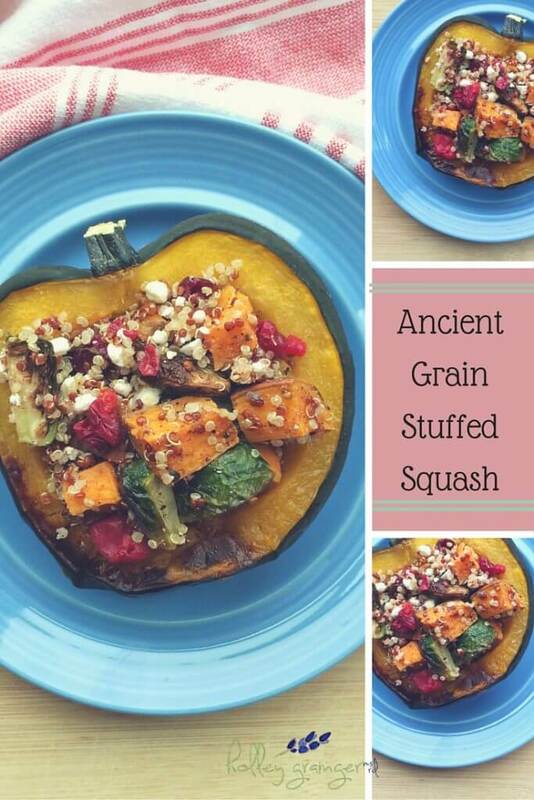 This stuffed squash recipe is that meal for me, bringing with it the added bonus of including nutrition superstars, ancient grains! Oh, and another reason I love this stuffed squash so much? It’s one of those meals that doesn’t require you to follow the recipe to a T, so no freaking out if you don’t have all the exact ingredients on hand! Praise! At the beginning of the week, I typically cook up a big pot of ancient grains and roast up a generous batch of vegetables to incorporate into my meals in various ways throughout the week, and this week I was all about quinoa, Brussels sprouts and sweet potatoes! Don’t have any of those on hand? Don’t worry! Like I said, this recipe doesn’t have to be followed exactly, so while the recipe calls for Brussels sprouts and sweet potatoes, they can easily be substituted for whatever veggie you’ve got on hand in the fridge that week, whether it be carrots, parsnips, or beets. The same goes with the quinoa; if you’ve got another ancient grain on hand such as farro, amaranth, or buckwheat, don’t be afraid to swap those in in place of the quinoa! Have some ancient grains left over from this recipe? Head on over to Holley’s recent blog post to see 36 other ways to use it up! Cut acorn squash in half and scoop out seeds with spoon. Place squash cut-side down on a baking sheet lined with aluminum foil. Transfer to middle rack of oven to roast for 30-35 minutes, or until flesh is easy to pierce with a fork. While squash begins to roast, wash Brussels sprouts and sweet potato. Quarter Brussels sprouts and dice sweet potato into uniform sizes. Combine in large bowl with ½ tablespoon EVOO, salt, pepper and garlic powder. Toss to coat. Remove baking sheet from oven, spreading Brussels sprouts and sweet potato out onto remainder of baking sheet. Return to oven to continue roasting 15-20 minutes. Combine quinoa and water or broth in medium sauce pan. Bring to a boil before reducing to a simmer. Cover and allow to continue simmering until water is absorbed, about 15-20 minutes. Spread cranberries on a small baking sheet line with aluminum foil and allow to roast for 5 minutes, or until berries just start to soften. Remove squash, vegetables and cranberries from oven and allow to cool slightly. 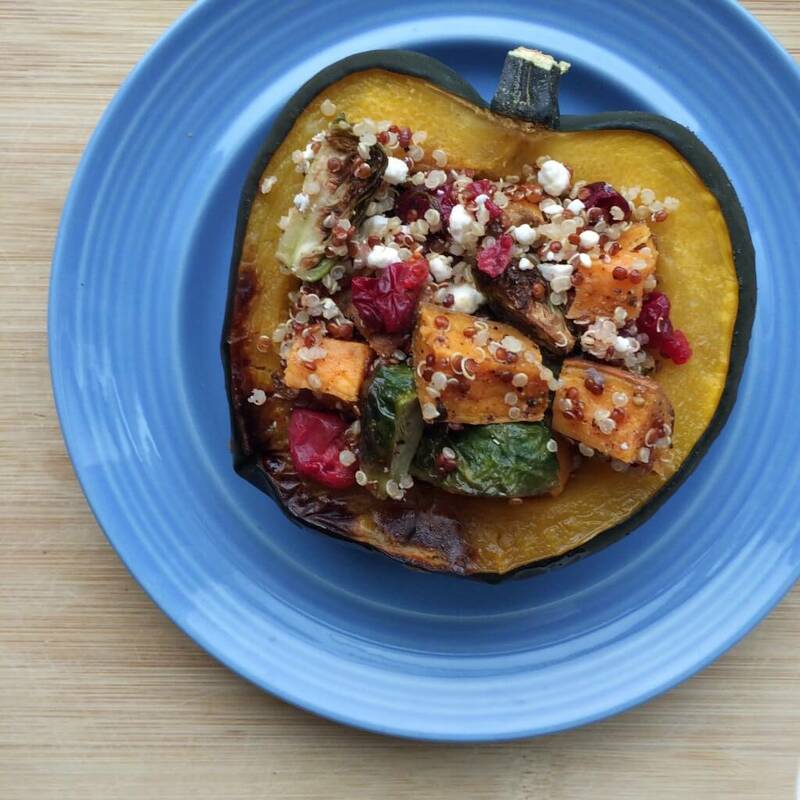 In a large bowl, combine quinoa with Brussels sprouts, sweet potato, cranberries and goat cheese before stuffing acorn squash halves with mixture. The perfect meal for those chilly fall evenings that is sure to get your taste buds dancing! Welcome Clara! Besides absolutely loving your name, I love this recipe! And the fact that you added goat cheese. My favorite! Hi Sonali! 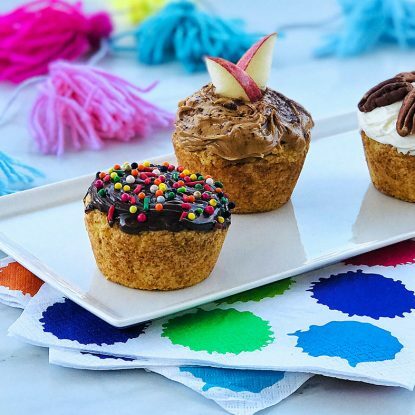 I’ve loved following along with you as well 🙂 I’m positive that your recipe is so delicious that it doesn’t even need the goat cheese, but it certainly can act as the cherry on top — next time! Can’t wait to see your combo! Welcome Clara! Great minds think alike – I shared a spiced quinoa recipe with roasted root veggies on the blog today too!! It’s such a yummy combination and love the versatility of it! 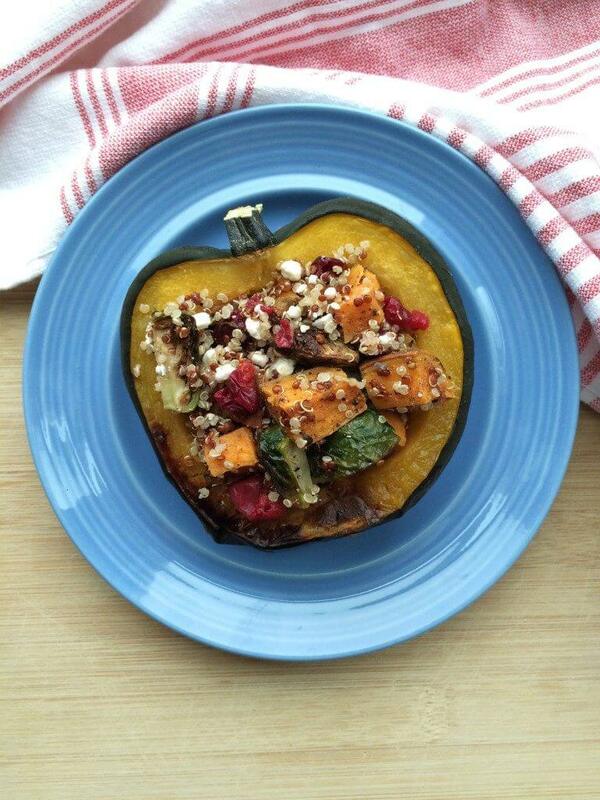 Great idea to stuff it in a squash!